Ecology is only part of the equation when it comes to understanding bluefin tuna. From the beach, the Tuna Research and Conservation Center (TRCC) near Monterey, California, looks more like a surf shop than a laboratory: it’s a low-roofed, white-walled shack that squats just a well-cast fishing line away from the Pacific Ocean. Within the center’s dim confines, however, the facility reveals itself as a marine biologist’s paradise. Three dozen young bluefin tuna circle a carousel-sized fiberglass tank, their flanks flashing with tiger stripes, their crescent tails casting frothy wakes. The fish—at around 15 kilograms, a fraction the size of the 300-plus-kilogram giants they will someday become—aren’t scheduled for feeding, but the appearance of human visitors has them revved up with Pavlovian enthusiasm. One tuna leaps from the tank, the crash echoing above the aqueous burble of the room’s pumps. Few of evolution’s wonders are so stunning as the bluefin, a tireless predator that can grow nearly to the length of a whitewater kayak. The fish dives as deep as two Empire State Buildings, swims as fast as a racehorse can run, migrates farther than humpback whales to feed and spawn. It owes many of its extraordinary talents to endothermy, commonly known as warm-bloodedness: a bluefin can boost its internal temperature up to 21 °C above the temperature of its surroundings, allowing it to venture into frigid waters that would kill its cold-blooded counterparts. Studying the esoterica of tuna physiology, then, might seem the ichthyological equivalent of fiddling while Rome burns. Block, however, believes that bluefins’ warm-blooded bodies provide the key to understanding their global movements—and, therefore, to their conservation. “Science in the ocean often gets driven by ecology. Most people see animals moving around and say, ‘Oh, they’re just following their prey,’” Block says, climbing down from the tank. “But a physiologist stumbles on the scene and says, ‘Wait a second—their bodies have rules.’” With the publication of a new paper in 2015, Block’s decades-long exploration of those rules reached a new peak: she and her colleagues became the first scientists ever to have measured the bioenergetics of wild fish, thereby unmasking precisely how much energy pelagic predators derive from their prey. Learning those rules might help usher in a new style of marine management—and, in the process, save the bluefin tuna. Though Block has not always been a bluefin devotee, she has a career-long fascination with warm-blooded fish. As a PhD candidate at Duke University in the 1980s, she cut her teeth studying billfish, so-called “cranial heaters” capable of warming tissues around their eyes and brain, an adaptation that may help them detect flashes of silver in dark waters. She tracked her radio-tagged billfish for days at a time, gauging their swim speeds and diving depths. Some scientists fall in love with species, others with ecosystems. Block grew enamored with physiological phenomena. “I live and breathe trying to understand why animals do what they do,” says Block in her office adjacent to the TRCC. The space is less workstation than marine science museum. Her eclectic collection includes a leatherback turtle skull, a plastic model of a tuna spine, and five decades of fish-tracking tags, from translucent cylinders packed with circuitry to steel tubes, intended to be returned by fishermen, that are stamped with the phrase “Big Reward $$$.” Block, who has shaggy hair and amused brown eyes, speaks in brisk, declarative statements; she conveys the impression of perpetual motion. In some ways, she’s migratory herself: the day I visit her in California, she has just returned from six weeks in the South Pacific, and she’s soon flying to Alaska to tag salmon sharks, another warm-blooded creature. In the early 2000s, Block began to examine a question that would help define the course of the TRCC’s research: how did water temperatures affect bluefins’ bodies? While endothermic animals are less susceptible to changing water temperatures than their cold-blooded counterparts, they’re far from immune. After all, your own internal furnace has to work harder when it’s too hot or cold. Surely tuna, too, had an ideal thermal range. To find out, Block and her team hoisted juvenile tuna—captured on barbless hooks off the coast of San Diego and housed at the center—into a swim tunnel that allowed them to swim in place. By measuring dissolved oxygen in the water while the fish “jogged,” Block’s team showed they indeed had an optimal ocean temperature envelope, 15 to 20 °C, at which they gulped the least oxygen and swam most efficiently. In theory, Pacific bluefin would adhere to that same narrow temperature band in the wild. A few years later, the TRCC’s researchers turned their attention to a related mystery: how tuna’s feeding habits affected their body temperature. When you metabolize a cheeseburger, your body generates both energy and heat, just as a running engine sizzles to the touch. But while it’s easy to watch a human devour a quarter-pounder at a diner, it’s a whole lot harder to observe a tuna chowing down in the middle of the Pacific. In theory, scientists could figure out how much any individual tuna was eating if they could somehow monitor the change in its body warmth: internal temperature could serve as a proxy for eating. Metabolic heat, then, was the master key to comprehending bluefin feeding patterns—knowledge that could help scientists pinpoint oceanic hotspots favored by these top marine predators. Enter Rebecca Whitlock. In 2010, Whitlock implanted amber-colored tags the size and shape of rubber erasers into the bellies of three captive tuna. Then she crouched in the rafters above the tanks at the TRCC and rained food onto the voracious fish. “You’d drop one sardine and they’d all go for it,” Whitlock recalls. “It could be quite difficult to tell which fish ate what.” Sticking colored markers to their fins made matters easier. By analyzing how food consumption affected internal temperature, Whitlock could determine how much, say, 500 calories of sardines or squid would elevate a tuna’s body heat. She’d cracked the code. TRCC scientists had figured out the temperature at which bluefins’ bodies ran the best and how eating warmed up the fish. Now it was time to apply those rules to wild fish—with data from the ocean. Fortunately, Block and her colleagues had plenty of information from which to extrapolate. From 2002 to 2009, the TRCC team had hooked more than 500 young wild Pacific tuna off the coast of southern California and Mexico, and outfitted them with the eraser-sized tags in their bellies. With the help of fishermen, the researchers recovered more than 170 of the data-logging sensors. Having figured out how prey consumption affected body temperature in the laboratory, Block and Whitlock could apply their new models to that existing data set and figure out exactly how wild Pacific bluefin tuna’s movements correlated with their feeding habits. In her ocean-view office, Block cracks open a laptop to show me what she found. 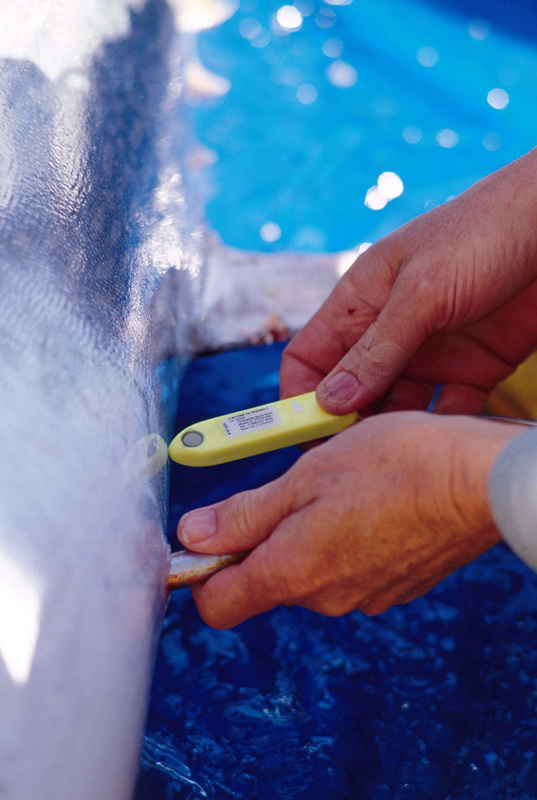 She points to a graph on which a red line, representing an individual bluefin’s body temperature, climbs from 20 to 25 °C—an indication that it’s just feasted on baitfish or squid. “This is one of the first times in the history of marine animals that we can watch prey ingestion at the level of kilocalories,” she says. She pulls up another slide, a map on which a constellation of animated dots, each representing a tuna, zip from Mexico’s Baja Peninsula to Northern California and back again. Clearly these fish roam widely—but why? When Block and her team had analyzed a different set of tuna migrations for a 2010 paper, they’d come to a standard ecological conclusion: the fish generally follow plankton blooms that attract other sea creatures. But when they incorporated sea-surface and body-temperature data in the new study, a simple two-step became a nuanced physiological ballet. The energetic demands of tuna’s warm bodies appeared to be at least partially steering their migrations. In winter, storms chill the waters off the California coast to below 15 °C—the bottom end of bluefins’ optimal temperature range, at which point their hearts slow and most fish cruise down to Mexico. As temperatures rise in late summer and early autumn, the increased metabolic strain pushes the fish north again. In October and November, they make predatory forays into nutrient-rich cold water, and then dart south into the “thermal refuge” of more temperate seas. By determining where the fish had eaten, Block and her colleagues could identify the crucial hunting grounds in the “Blue Serengeti.” But the scientists were in for a surprise: the tuna sometimes spurned the high-productivity areas where you might expect them to feed. Not even the enticement of abundant food could lure them out of their physical comfort zone. Big meals only help if your body can efficiently digest them. Physiology, rather than ecology alone, helps guide the tuna’s movements. So why, precisely, does this matter? After all, scientists, Block included, have learned an awful lot about tuna behavior by simply tracking their wanderings. If we know where fish move, do we need to know why? Creating mobile protected areas may seem like a daunting task, but it’s already standard procedure in the waters north of the Hawaiian Islands. There, the National Oceanic and Atmospheric Administration (NOAA) operates a service called TurtleWatch, which helps longline fishermen avoid patches of ocean where sea-surface temperatures are favorable for loggerhead turtles. And then, of course, there’s climate change, which has helped raise global sea surface temperatures by as much as a full degree Celsius over the past 140 years. A better understanding of the bluefin tuna’s thermal limits could help scientists and fisheries managers predict how the fish will respond to further warming and identify future protected areas. Back in Block’s office, the physiologist gestures out her window toward the cerulean waters of Monterey Bay, a vibrant tableau of marine biodiversity. Hundreds of cormorants air out their wings atop guano-stained rocks just offshore, and humpback whales blow curtains of mist into the warm breeze. To Block, the scene conjures more questions. “We struggle to answer even the basic question of why the whales are here today and not four days ago,” she says ruefully. Until scientists can measure when animals are eating, how much energy they’re taking in, and how energy flows through a food web, Block adds, they won’t truly understand ocean ecosystems. Any fisherman who’s tracked seabirds to a bait ball recognizes one of nature’s most immutable laws: predators follow prey. But a marine animal’s niche is also dictated by the ocean conditions where its heart functions the best, where it most easily metabolizes food, where its blood vessels exchange heat most effortlessly. Time to grant physiologists a seat at the marine management table. 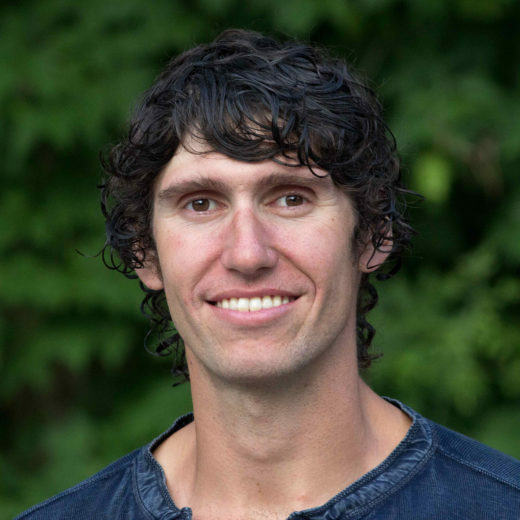 Ben Goldfarb is an environmental journalist whose work has appeared in Science, Mother Jones, Orion Magazine, The Guardian, and many other publications. He is the author of Eager: The Surprising, Secret Life of Beavers and Why They Matter. He’s also an angler, scuba diver, and nudibranch aficionado. Cite this Article: Ben Goldfarb “Cracking Open the Tuna Code,” Hakai Magazine, Feb 9, 2016, accessed April 23rd, 2019, https://www.hakaimagazine.com/features/cracking-open-tuna-code/.